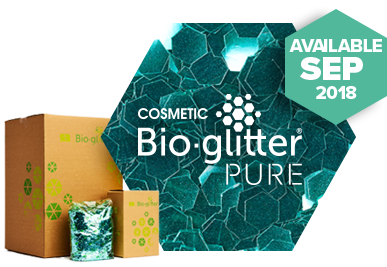 The first product developed by Ronald Britton Ltd, now rebranded as Cosmetic Bioglitter Sparkle, Cosmetic Bioglitter® Sparkle, uses our unique plant derived film to offer an eco friendly glitter without equal in the industry and represents our brightest effect Cosmetic Bioglitter®. Cosmetic Bioglitter® does contain a small amount of synthetic material necessary to create high reflective elements whilst retaining functionality in application. Compared with plastic glitter, this will have a significantly reduced impact on the environment and as with all Bioglitter products we are driving to achieve 100% plastic free. Certified to OK Compost Home and Marine biodegradable to ASTM D6691-09 in addition to Industrial ComposinG Standards EN13432 and ASTM D6400.